Successful “organic” production is a matter of where you grow and how you grow. Look! No scab, but insect feeding has pockmarked the fruit anyway. There is a lot of controversy in the world today about the risks and benefits of “organic” versus “conventional” foods. It is an argument that Grandpa tries to stay out of because true believers of one system and another just don’t seem to change their views no matter what the facts are saying. A lot of the controversy may stem from what one believes the true definition of “organic” is versus another’s. Many customers of Grandpa’s Orchard trees want to grow fruit the easiest way without having to spray all summer long for diseases and insects. In truth, raising fruit always means that you will be continually fighting insects. It will either come down to letting them munch on your produce or you munching down on them. There really are no fruit varieties that are immune to insect infestation or disease. Insects, diseases and fruits have had pest/host relationships for millions of years. I doubt it will change anytime soon, just because humans are debating “organic” versus “conventional”. All of the varieties Grandpa offers (or anyone else for that matter) are going to be susceptible to insect infestations. While some varieties may be less susceptible than others, what is more important is the climatic and environmental conditions you grow fruit under. The dryer parts of the West are more suitable for “organic” foods and less pesticide use than the much more humid Southern areas, for example. Insects thrive better under humid conditions than dryer conditions. Less humidity = less bug infestation = less requirement for pesticide use. When it comes to diseases, the above argument is also true. The dryer West is much more suitable for organic production than the humid South. Most of the serious diseases have less of a chance to become big problems when there is less frequent rainfall. 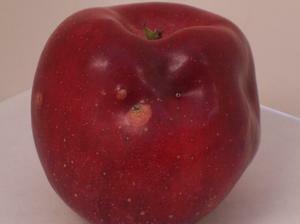 Scab is one of the destructive diseases that affect the fruit itself. In Michigan, New York and other eastern US apple growing regions, growers have to really stay on top of scab infestations in the spring. When the trees are blooming and fruit is very young, it may be necessary to spray with fungicides up to 10 times per spring in order to produce a marketable crop. It all depends on the weather. Scientists have determined guidelines for wetness, humidity, temperature and length of the wetness period to help growers reduce the number of sprays to a minimum and guide them to use more effective fungicides. In eastern Washington, because the apples are grown in the more desert conditions, east of the Cascades, there is much less rain in the spring, therefore, there is much less scab pressure; resulting in only spraying for scab a few times. If you want to grow apples with less fungicide, plant apple varieties that have been bred and introduced for scab-resistance (like Liberty, GoldRush, Pristine, etc.). Many of these will also have some resistance to other diseases such as fire-blight, mildew, cedar apple rust and other diseases which may be a problem in your area. Fire-blight is one of the biggest disease problems. There are new varieties being introduced that have improved fire-blight resistance and which are similar to many of the varieties you are familiar with at the grocery store (Blake’s Pride, Potomac and Magness). However, there really is no preventative spray the average backyard fruit grower can use to prevent fire blight. Unfortunately there are not a lot of cherry varieties which are resistant to the important cherry diseases or insects. Since cherries are very early ripening, hopefully you can harvest your fruit before any of the common diseases hurt the leaves and defoliate the trees or insects can infest the fruit. Birds are a bigger threat to ripening fruit. Stone fruits in this class are most susceptible to brown rots on the fruit in the humid areas. While there may be differences between the fruit varieties, none of them are very resistant. Keeping the fruit from being infected early in the season by removing mummified fruit from the previous season along with diseased limbs, etc. will help prevent disease. Peach leaf curl is a common disease in the early spring where it is humid. While there are a couple leaf-curl resistant varieties like Frost and Avalon Pride, we have trouble sourcing them. On plums, black knot is an important disease and some varieties are more resistant than others, but not immune. Finally, here is a myth that many believe: Organic produce never gets sprayed with pesticides or fungicides. This is just not true, there are numerous, legally labelled “organic” sprays out there today. Some of them may be more toxic to humans (and other life forms) than many of the synthetic chemicals. They can be used in an organic systems most often because they occur naturally in nature, rather than synthetically and chemically processed. In fact, there is very little produce out there that doesn’t get some kind of protective spray, mostly because even the organic producer needs to be able to provide pest-free produce to his customers. If you have any questions, please don’t hesitate to contact Grandpa! ← What Makes an Heirloom an Heirloom?